Just like our ancient ancestors, when the weather begins to warm up, we get the undeniable urge to explore the land. Fortunately, today we have high-tech motor vehicles to travel with–and even some, like RVs, which are specifically designed for that purpose. While we’ve come a long way, there are still some precautions you’ll want to take to ensure you only get the type of adventure you’re seeking. Make sure your car is fit for the trip you’re about to take. If you’re travelling long-distance or across the country, it’s important to note that you’re likely putting your vehicle under more strain than you would day-to-day. To ensure it’s ready for the open road, you can make an appointment at your local Master Mechanic to have it inspected, or inspect the vehicle yourself. If you decide to give your car a once-over yourself, you should check the tire pressure, tread levels, oil, brakes, wiper blades, and fluid levels. If it’s been a while since you’ve had routine maintenance like oil changes and tire rotations, get them done before you go. This is a time when it’s better to be proactive to avoid any issues from ruining your trip. Across Canada, it’s a finable offence to drive and look at your cell phone, even if it’s for navigation purposes. Many cars made in the last few years come equipped with GPS navigation as part of their onboard infotainment system. While these systems are great for getting you to your destination, they’ll only work if they’re connected to a network. It’s important to keep a backup, like a physical map or unmounted GPS system that you can use if you can’t access your vehicle. Always plan ahead and have an alternative route, too, in case you encounter a roadblock or unexpected issue. While you’re on the road, you never know when you’ll need something and if you’ll have access to a store that sells it. Packing proactively is essential. This includes critical fluids for your vehicle and a roadside assistance kit, which you can get at your local Master Mechanic, or online. Unless you have a roadside assistance membership like CAA, and time to wait for help, you should also keep a spare tire and know how to change it. Your car’s manual should have instructions on this, or you can look at video tutorials online. Try to practice at home before you go, so you’re ready on the road and don’t waste unnecessary time. This goes without saying, but make sure you have a tire jack, too! Pack extra fuel for your vehicle and your passengers. You don’t realize how helpful a full fuel can and some extra food are until you need them. While you’re driving, buckle up, ensure you have enough rest and be aware of your surroundings. Always look at the weather ahead of time, so you know what to expect, and schedule regular pitstops to eat, stretch your legs, and sleep. 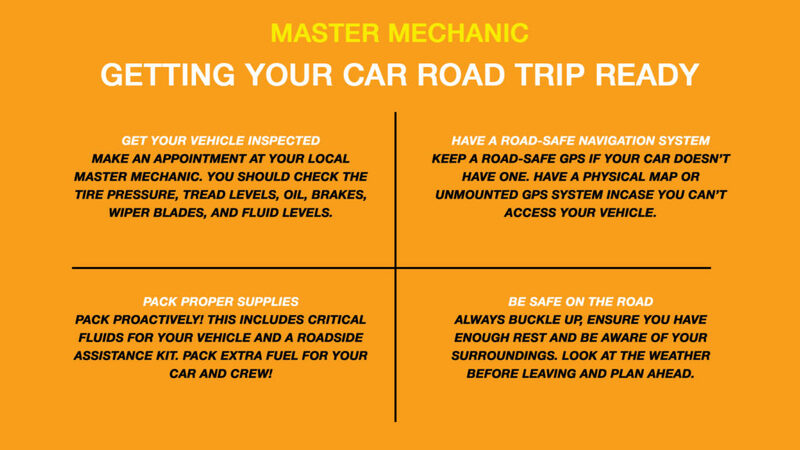 If you have any questions, need supplies for your vehicle, or want to have it inspected before your road trip, contact your local Master Mechanic to book an appointment. Happy driving!